The Chrysler Crossfire's 20% Chrysler and 80% Mercedes, but the best Mercedes engine given to us Americans was the SRT6 supercharged 330 hp V6. Someone's fixed this slight by dropping a very Bruce 55K V8 into a Crossfire. Krosspressor anyone? If you've never heard of SPEEDRIVEN it's because, until recently, they haven't had much of a voice. Now that Jo Borras, formerly of Switzer and RENNtech's on board, expect to hear more of the loud, V12-powered screaming from the little shop in Palatine, Illinois. Let's start with this Crossfire, which takes a 55K "Kompressor" mill and adds it into the engine bay of the underloved Chrysler-badged product. Note, the AMG 55K put out a maximum of 500 hp at 6100 RPM stock with a hair-rising 516 lb-ft of torque. Stock. 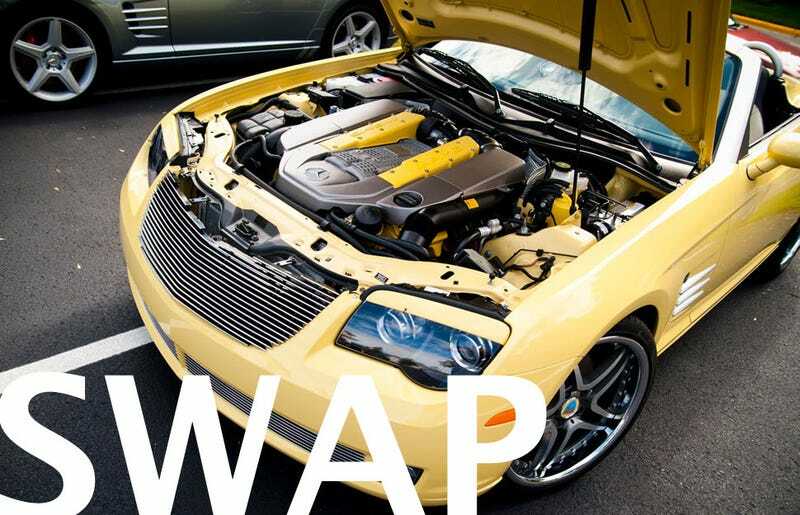 The physical swap was done by Rudy Coparty and all the work to make it work done by SPEEDRIVEN, including adding a rear differential from an E55K, programming the transmission, and giving it a custom manifold-back exhaust to give it the appropriate growl. This car's a driving test bed for technology from the shop and, other than the PMY color, a good use of an extra engine. But why would you have an extra engine lying around? More on that later.